Beaumont’s Chartier restaurant holds several distinctions. It is, to date, the most successful restaurant Kickstarter campaign in Canada and the first successful restaurant Kickstarter campaign in Alberta. 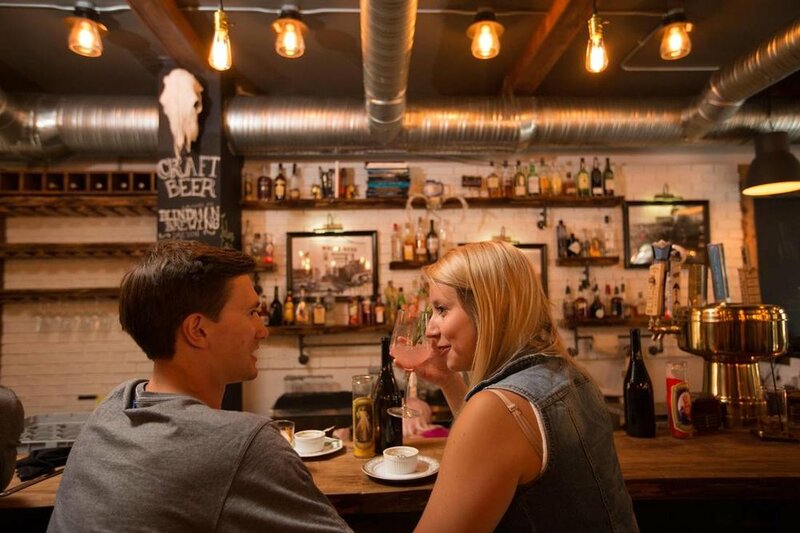 Moreover, this quaint, hilltop spot just south of Edmonton serves up a commendable and well-executed selection of Québécois fine dining, the likes of which are rarely witnessed west of La Belle Province. Chartier embodies an air of rustic whimsy. Wooden beams and antique pulleys sport dangling light bulbs, chairs and chinaware are deliberately mismatched, and framed chalkboards proclaim the evening’s features. Strategically placed antlers sprout from the walls intermittently. A large homestead map blankets one wall; the names of Chartier’s many supporters are carefully etched within the map’s geographic features. A modified fleur-de-lis – Chartier’s adopted logo – cleverly swaps out the middle petal for the silhouette of a fork. Astute hands behind Chartier’s weathered wooden bar conjure up a veritable alchemy of concoctions. Dandelion Sangria ($15) – Moscato d’Asti, St. Germain and Domaine de Canton – are summer in a glass. A jaunty yellow aster on top just seals the deal. Le Melon Fracassant ($12) stirs together gin, maraschino and watermelon, upping the ante with lashings of honey and pepper. Indeed, balanced beverages portend similar skill from the kitchen. Chartier’s menu is divided into small and large plates. Selections from the former include Haricots Vert ($9) that are, quite literally, canned beans. 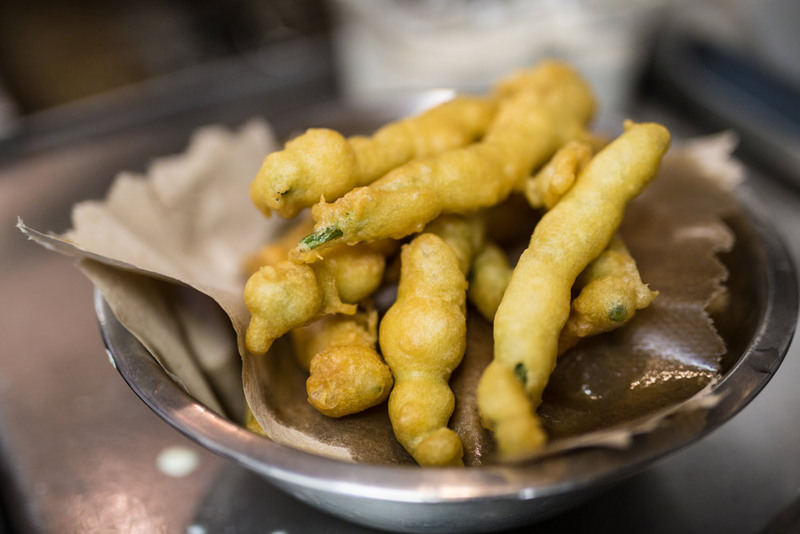 A bundle of serpentine green beans, enrobed in crisp tempura, pop out of a maple syrup can, surrounded by a smear of sweetly acrid smoked maple mayo. Poutine ($10) embodies every trait that a good dish of spuds and gravy ought to have: rough-hewn, triple-fried chips, scads of melty, squeaky cheese curds, all awash with rich brown gravy. A seasonal Salade ($11) balances out heartier fare with fresh greens, radish and onion, all of which are lightly dressed with subtle vanilla and bay leaf vinaigrette and sprinkled with blue cheese and walnuts. Large plates impress in both physical stature and composition. A Beaumont Smoked Meat Sandwich ($15) stars house-smoked brisket piled high and barely contained by thick, tangy slices of sourdough. 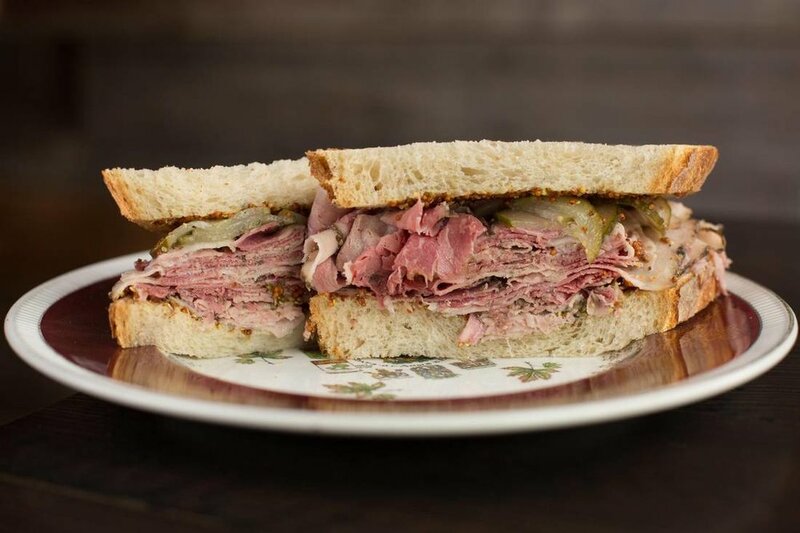 Ribbons of smoky, fragrant beef are kissed by thyme Dijon and crowned with piquant pickle slices. Indeed, this enviable sandwich is comparable to the best Montreal has to offer. A glass of Mas Donis Rosé ($9) brings forth dry notes of red berries that easily stand up to both protein and bread. 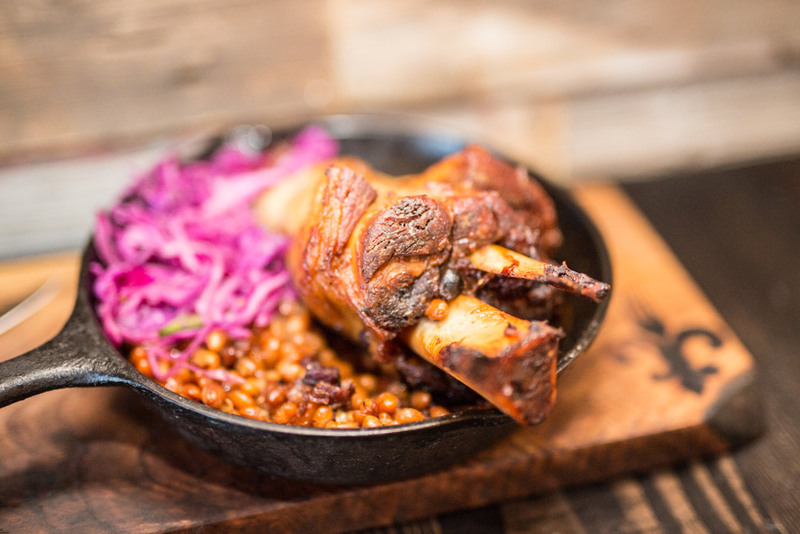 Cleverly named Duck Grunt ($26) riffs on a back-east favourite: a traditionally sweet blueberry grunt (which falls somewhere between a crisp and a cobbler in composition) is retooled as a savoury foil for just-rare slices of pan-roasted duck breast. Paired with a crisp muscadet – this one from Domaine de la Tourmaline ($9) – this grunt is at once unexpected, creative and immensely satisfying. It is a relief that the dessert menu holds but four items. Anything more, and decision making would be rendered impossible. Boom Chocolat ($9), as emphatic and assertive as its name implies, stands out. Voluptuous chocolate mousse is blanketed with toasty marshmallow crumbs, crowned with a quenelle of Saskatoon berry sorbet. It is rich, nostalgic and not a spoonful too large. Chartier dazzles with robust flavours and well-honed service. Its many supporters clearly recognized a winning concept when they helped convert Chartier from fantastic vision into arcadian verisimilitude. This small-town gem is but a short drive from the City of Champions and is, quite frankly, Canadiana at its best. The Beaumont Smoked Meat Sandwich. Sangria with an edible flower.